So how can we connect to this way of thinking and doing? How can we access the tools available to us today? How can we handle the complexities of the challenges we face? Our causal, mechanistic mindset has greatly served us when it comes to modern industrial developments, and has ushered in unforeseen results and prosperity. Systematic thinking, which is inspired from the observation of living beings and organisms, has taught us a lot about important connections we find in organizations. So, in order for us to take the next step, we need to use the very best tools in the shed. With these tools, we can manage complexity, create space for manifesting solutions, and allow everyone who is inspired the possibility to participate in the unfolding of brand-new opportunities. The intellect is perfectly capable of finding quick answers to existing problems, but how will it stand up to the complexity of our world in the future, with all of the unforeseen challenges, the apparent paradoxes, and dualities? In 1935, Albert Einstein and his colleagues Boris Podolsky and Nathan Rosendesigned a thought experiment encompassing a paradox struggle that led him to this thought: „God does not play dice.“Which means that nothing in life happens purely by chance. Just imagine how powerless we would be in our everyday lives, how chaotic that would be, and which force would prevail, when we wouldn’t be the creators of our own lives, when we would find ourselves in the middle of our lives unable to influence our own destiny? Quantum physics has taught us that an all-encompassing intelligence can be traced down to the smallest sub atomic particles that can connect to other particles, regardless of their geographical distance. The practice of awareness and observance of “reality” has its own direct effect on our “reality”. Englishman Rupert Sheldrake, who holds a doctorate in biochemistry since 1967, describes this phenomenon as a fundamental morphogenetic field in which we are linked in consciousness to all of creation. Even if this is only a half-truth, it would mean that we need to leave the linear thinking of the 20thcentury behind, and allow ourselves to access an integral way of thinking which holds the key to discovering answers for our future. The answer lies in the integration of our intellect and our intuition. This can be particularly effective when the will is there to become masters of our own trust. In this consciousness, chaos und change take on a whole new meaning – they become the gateway to a limitless life in the flow. What this means is that when you choose a thought, it will manifest itself instantly in the material world, because it is connected to the universal World Wide Web of all conscious people. For all of the control freaks among us, and those who run behind material goals and put their own well-being on the shelf. For those who have up until now, only really found satisfaction through the approval of others. Now is the chance to get approval from the only place that really counts – from within. : „Happy for no good reason.“ You are your own source of joy and fulfillment. 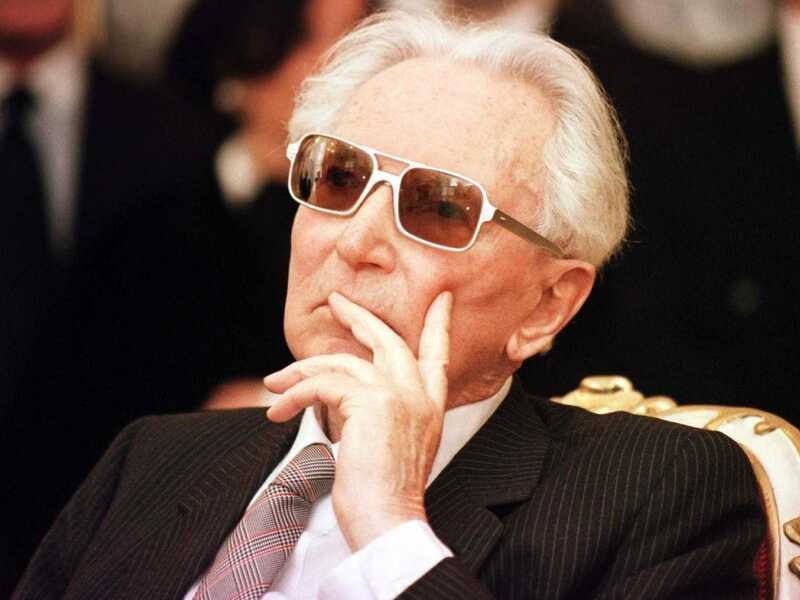 In September 1942, Viktor Frankl, a prominent Jewish psychiatrist and neurologist in Vienna, was arrested and transported to a Nazi concentration camp with his wife and parents. Flickr/Christian HaughenEven though American happiness levels are at a four-year high, 4 out of 10 Americans have not discovered a satisfying life purpose. “Happiness without meaning characterizes a relatively shallow, self-absorbed or even selfish life, in which things go well, needs and desire are easily satisfied, and difficult or taxing entanglements are avoided,” the authors write. How do the happy life and the meaningful life differ? Happiness, they found, is about feeling good. Specifically, the researchers found that people who are happy tend to think that life is easy, they are in good physical health, and they are able to buy the things that they need and want. While not having enough money decreases how happy and meaningful you consider your life to be, it has a much greater impact on happiness. The happy life is also defined by a lack of stress or worry. The psychologists give an evolutionary explanation for this: happiness is about drive reduction. If you have a need or a desire — like hunger — you satisfy it, and that makes you happy. People become happy, in other words, when they get what they want. Humans, then, are not the only ones who can feel happy. Animals have needs and drives, too, and when those drives are satisfied, animals also feel happy, the researchers point out. “Happy people get a lot of joy from receiving benefits from others while people leading meaningful lives get a lot of joy from giving to others,” explained Kathleen Vohs, one of the authors of the study, in a recent presentation at the University of Pennsylvania. In other words, meaning transcends the self while happiness is all about giving the self what it wants. People who have high meaning in their lives are more likely to help others in need. “If anything, pure happiness is linked to not helping others in need,” the researchers, which include Stanford University’s Jennifer Aaker and Emily Garbinsky, write. What sets human beings apart from animals is not the pursuit of happiness, which occurs all across the natural world, but the pursuit of meaning, which is unique to humans, according to Roy Baumeister, the lead researcher of the study and author, with John Tierney, of the recent book Willpower: Rediscovering the Greatest Human Strength. Baumeister, a social psychologists at Florida State University, was named an ISI highly cited scientific researcher in 2003. The study participants reported deriving meaning from giving a part of themselves away to others and making a sacrifice on behalf of the overall group. In the words of Martin E. P. Seligman, one of the leading psychological scientists alive today, in the meaningful life “you use your highest strengths and talents to belong to and serve something you believe is larger than the self.” For instance, having more meaning in one’s life was associated with activities like buying presents for others, taking care of kids, and arguing. People whose lives have high levels of meaning often actively seek meaning out even when they know it will come at the expense of happiness. Because they have invested themselves in something bigger than themselves, they also worry more and have higher levels of stress and anxiety in their lives than happy people. Having children, for example, is associated with the meaningful life and requires self-sacrifice, but it has been famously associated with low happiness among parents, including the ones in this study. In fact, according to Harvard psychologist Daniel Gilbert, research shows that parents are less happy interacting with their children than they are exercising, eating, and watching television. “Partly what we do as human beings is to take care of others and contribute to others. This makes life meaningful but it does not necessarily make us happy,” Baumeister told me in an interview. Meaning is not only about transcending the self, but also about transcending the present moment — which is perhaps the most important finding of the study, according to the researchers. While happiness is an emotion felt in the here and now, it ultimately fades away, just as all emotions do; positive affect and feelings of pleasure are fleeting. The amount of time people report feeling good or bad correlates with happiness but not at all with meaning. Meaning, on the other hand, is enduring. It connects the past to the present to the future. “Thinking beyond the present moment, into the past or future, was a sign of the relatively meaningful but unhappy life,” the researchers write. “Happiness is not generally found in contemplating the past or future.” That is, people who thought more about the present were happier, but people who spent more time thinking about the future or about past struggles and sufferings felt more meaning in their lives, though they were less happy. Having negative events happen to you, the study found, decreases your happiness but increases the amount of meaning you have in life. Which brings us back to Frankl’s life and, specifically, a decisive experience he had before he was sent to the concentration camps. It was an incident that emphasizes the difference between the pursuit of meaning and the pursuit of happiness in life. In his early adulthood, before he and his family were taken away to the camps, Frankl had established himself as one of the leading psychiatrists in Vienna and the world. As a 16-year-old boy, for example, he struck up a correspondence with Sigmund Freud and one day sent Freud a two-page paper he had written. Freud, impressed by Frankl’s talent, sent the paper to the International Journal of Psychoanalysis for publication. “I hope you don’t object,” Freud wrote the teenager. While he was in medical school, Frankl distinguished himself even further. Not only did he establish suicide-prevention centers for teenagers — a precursor to his work in the camps — but he was also developing his signature contribution to the field of clinical psychology: logotherapy, which is meant to help people overcome depression and achieve well-being by finding their unique meaning in life. By 1941, his theories had received international attention and he was working as the chief of neurology at Vienna’s Rothschild Hospital, where he risked his life and career by making false diagnoses of mentally ill patients so that they would not, per Nazi orders, be euthanized. That was the same year when he had a decision to make, a decision that would change his life. With his career on the rise and the threat of the Nazis looming over him, Frankl had applied for a visa to America, which he was granted in 1941. By then, the Nazis had already started rounding up the Jews and taking them away to concentration camps, focusing on the elderly first. Frankl knew that it would only be time before the Nazis came to take his parents away. He also knew that once they did, he had a responsibility to be there with his parents to help them through the trauma of adjusting to camp life. On the other hand, as a newly married man with his visa in hand, he was tempted to leave for America and flee to safety, where he could distinguish himself even further in his field. When he returned home, he found it. A piece of marble was lying on the table. His father explained that it was from the rubble of one of the nearby synagogues that the Nazis had destroyed. The marble contained the fragment of one of the Ten Commandments — the one about honoring your father and your mother. With that, Frankl decided to stay in Vienna and forgo whatever opportunities for safety and career advancement awaited him in the United States. He decided to put aside his individual pursuits to serve his family and, later, other inmates in the camps. Baumeister and his colleagues would agree that the pursuit of meaning is what makes human beings uniquely human. By putting aside our selfish interests to serve someone or something larger than ourselves — by devoting our lives to “giving” rather than “taking” — we are not only expressing our fundamental humanity, but are also acknowledging that that there is more to the good life than the pursuit of simple happiness. Last week at MIT I hosted a group of leaders and change makers from Indonesia. With its 17,000 islands and 250 million inhabitants, Indonesia is the third largest democracy and the biggest Muslim country in the world. Several members of the visiting group are key players in CTI, the Coral Triangle Initiative, a multi-stakeholder initiative focusing on sustainable fisheries and marine stewardship in the world’s second most important biodiversity region (second only to the Amazon region). The MIT IDEAS program, which they embarked on last week, is a 15-month journey of profound individual and institutional innovation and change. All participants remain in their existing jobs and organizations, but over the next 15 months they will meet regularly in small coaching circles, as well as in five whole-group workshops for 3-5 days each, progressing on a journey from total immersion to e deep reflection andlearning by doing. Last week we took our first total-immersion journey. The participants engaged in intense discussions with key thought leaders in global finance (Simon Johnson), systems thinking (Peter Senge), data-driven societies (Sandy Pentland), urban transformation (Phil Thompson), mindful systems change (Dayna Cunningham), and system dynamics (John Sterman). In addition, we threw them into highly experiential learning environments. On campus they visited the Media Lab, practiced the IDEO method of design thinking, and explored Boston’s hotspots of social innovation through small-group learning journeys. We also taught them deep reflection practices to help them be receptive not only to the new ideas that emerged from the MIT eco-system but also to the new ideas that emerged from within: who they are now, and who they want to be going forward. Many found it to be a profound, moving, and in some cases even life-changing experience. As one of them said on the final day: I have been born twice. The first time in Indonesia, the second time here in Boston. He explained that he felt he had come closer to his deepest human capacity to create. 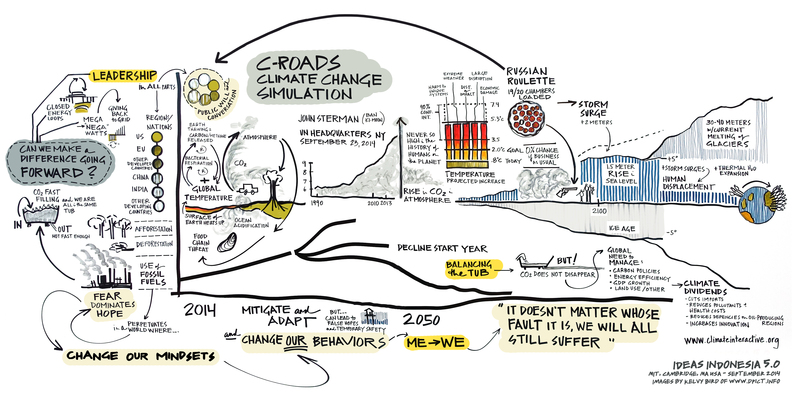 One half-day workshop during the middle of the week offered them a window onto the current conditions and changes that we deal with in just about every larger process of systems change on the planet. Picture this: they entered the workshop room at 8.30 a.m. and saw that the room was set with six tables, one each for the U.S. delegation, the EU, other developed countries, China, India, and other developing countries. They were greeted by the facilitator, a person playing the role of Ban Ki-Moon, Secretary General (SG) of the UN. The delegates quickly realized that they were not all equal. While the tables of the delegations from the U.S., the EU, and other OECD countries were set with delicious food, China and India had no food on their tables. The delegates from “other developing countries” were even asked to sit on the floor, with their chairs and a table being removed. n the SG asked the delegates to rework their commitments in a second round of negotiations. But first he gave them a tutorial on visualizing the potential impact for each region in the year 2100. Having seen the results of their collective decision-making in round 1, in round 2 the delegates developed commitments of a whole different order of magnitude. They were much more courageous, collaborative, and determined. But still, the projected scenario for 2100 was devastating, although no longer as catastrophic as the round 1 scenario. It took a full third round for them to come up with an almost-final set of commitments and decisions, which, according to the model, would result in a scenario that was close to being acceptable. 1. The behavior we saw in round 1 is exactly the same as what we have seen from our actual delegations in most international negotiations on climate change over the past decade. 2. Note that the delegates in our simulation game were well-informed (for example, they all watched a “disruption video” before beginning their work) and well-intentioned. Yet, as a group, they acted just as dysfunctionally as our politicians do. 3. In rounds 2 and 3, they abandoned their silo perspective (“this is all that we can do–and by the way, the real polluters are sitting at that other table…”) and adopted a perspective of “seeing the whole.” Their mindsets shifted from an ego-system awareness (me) to an eco-system awareness (we)–that is, an awareness of the whole. 4. The big question on the table in almost every real-world case of large systems change is how to make that shift. What happened in that half-day climate simulation game is often missing on the larger, real-world scene. i. A container: You need to bring all key stakeholders together in a single room, and then create a container–that is, a holding space–in which they can interact and learn with each other. ii. Science: You need good science in order to let the data talk to you–that is, in order to get beyond everyone’s currently favored opinion. iii. Dialogue: You need to close the feedback loop between collective action and awareness; you need to make the system see itself (which is the essence of dialogue). iv. Aesthetics. The origin of the term aesthetics lies in the Greek word aisthesis, which means perception through the senses. In the workshop, it was key to feel the impact of sea-level rise through the map visualization, the oversupply and non-supply of food to the delegate tables, and other inequities. v. Facilitation: an “SG” to hold the transformative space. When the shift happens between round 1 and rounds 2 and 3, participants let go of their ego-system view (‘look at what they are doing to us!’) and begin to operate from an eco-system view (‘look at what we are doing to ourselves!’). The above graphic drawn by my colleague Kelvy Bird depicts this basic point on the upper right: turning the lens back on ourselves and planet earth. It captures the ecological, social, and spiritual divides above the iceberg’s waterline, and all the deeper root issues and sources below the waterline. What does it take to address the current crises of our time at the level of the source (as opposed to the level of the symptoms)? What it takes, we believe, is a journey–a journey on which the social field shifts from ego-system awareness (silo view) to eco-system awareness (seeing from the whole). That was the shift the Indonesian participants made in the climate change workshop–and in other key experiences during the week. It was that shift that resonated most deeply within their own beings, with who they wanted to be. It’s that shift that they will be able to prototype in the context of their own systems throughout their action learning projects in 2015. Picture 7: Shifting the Social Field (Theory U). How can we create these five conditions not only in small workshops, but in society as a whole? How can we reframe our public conversation on climate change by putting these conditions in place? Where have you seen similar shifts? And what conditions did you see that enabled such shifts to occur? 17-year-old Mighty Girl Cynthia Lam of Melbourne, Australia wants to help people living without access to clean water and electricity — and this ingenious young inventor has developed a device that can purify water and generate electricity using only the power of the sun! Cynthia is now bringing her potentially life-changing invention, which she calls H2Pro, to a global stage as one of the 2014 Google Science Fair’s 15 global finalists. Cynthia’s H2Pro device is made up of two parts — an upper unit for photocatalytic water-purification and hydrogen-generation and a bottom unit where additional water filtration takes place. Dirty water enters the top of the device and it passes through a titanium mesh which, when activated by the sun, sterilizes the water. This photocatalytic reaction also splits the water into oxygen and hydrogen — the latter of which is used by a hydrogen fuel cell to generate power. Impurities in the water such as detergents also provide more hydrogen; thus, allowing the device to generate more power. Kudos to Cynthia for her inventiveness and interest in helping others! We wish you the best of luck in the Google Science Fair! Mealtime at Living Well Care Home and the Ethan Allen Residence includes farm-to-table foods made from scratch, with a chalkboard list of which farms provided the ingredients. A naturopathic physician is the medical director, and yoga and Tai Chi classes are available to residents. Inspired by Feng-shui, the rooms have warm and inviting colors. Essential oils are used as cleaning products, all of which are nontoxic. What might sound like a high-end spa are two innovative senior care facilities in Bristol and Burlington, Vermont. When Dee DeLuca and a small group of like minded folks acquired Living Well, a 15-bed residence, 1o years ago, and Ethan Allen, a 34-bed home, last year, she had a vision of transforming these senior care facilities into loving and supportive environments where elders could thrive with few or no medications, natural foods and holistic treatments. This vision, along with a dynamic framework to govern the organization, was instrumental in the shift from business-as-usual, in an industry where high employee turnover, isolated residents and processed food are common. Employees who have a say in how they work are engaged employees, with a high level of commitment to the decisions they make. Many studies have shown a strong relationship between employees’ workplace engagement and a company’s overall performance. A 2013 Gallup poll estimates that only 13 percent of workers worldwide are engaged, resulting in $300 billion in lost productivity annually in the U.S. alone, as well as higher rates of absenteeism, safety incidents and turnover. To put it simply: Disengaged employees erode the bottom line. DeLuca believes dynamic governance has helped create a fundamental shift, impacting staff and residents alike. “When people know they have control over how decisions are made in the place where they work and live, they behave differently,” says DeLuca. Living Well went from operating in the red before the acquisition to being in the black. The failing senior care facility was transformed into an award-winning home that embraces holistic health, a transition that DeLuca believes was made smoother through the use of dynamic governance. Importantly, this initiative has helped save the organization money, while boosting quality of life. The facilities buy food in bulk directly from local farms, preserving the food for off-season. DeLuca says that their average meal costs are lower than the industry average, while offering higher quality food. She credits serving whole foods and offering holistic health options with lowering medication costs. In dynamic governance, authority for policy decisions is delegated to small groups of members (M) called circles with distinct aims and domains. Each circle is connected to the next higher circle by two people – an operational leader (L, in red), and a delegate (D, in green) elected by the lower circle – who are full members of both circles. The result is to link the circles for flow of policies, information, and feedback, bottom-up as well as top-down. Functional circles may have sub-circles; the number of circles and of levels depends on the size and complexity of the organization. Dynamic governance – also called sociocracy – is a system for decision-making, organizational and corporate governance, and project management that creates more inclusive and effective organizations. Employees at all levels make policy decisions that govern their work; the levels are linked for flow of policies, information, and feedback, bottom-up as well as top-down. The staff, residents and family members at Living Well and Ethan Allen are all part of the governance and decision-making structure. Both facilities have formal and informal practices that allow elders to have a voice in making decisions. An elder council meets monthly to discuss their needs and concerns. A council member then sits at the head of the table at the monthly staff meeting to present a report. This perspective is invaluable for continuously improving the home. DeLuca sees Living Well staff unfolding rugs that may be a tripping hazard, or tidying common spaces – regardless of who is officially responsible. When staff takes responsibility for the betterment of the whole, it creates a safe and happy home, and she attributes this shift to using dynamic governance. Sarah Lozanova is a regular contributor to environmental and energy publications and websites, including Mother Earth Living, Green Building & Design, Triple Pundit, Urban Farm, and Solar Today. Her experience includes work with small-scale solar energy installations and utility-scale wind farms. She earned an MBA in sustainable management from the Presidio Graduate School and she resides in Belfast Cohousing & Ecovillage in Midcoast Maine with her husband and two children. ESOPs give employees part ownership of their companies and prevent major job losses when owners retire. But only two states support them. Do you recall the single word of advice for achieving prosperity that Dustin Hoffman was given in The Graduate? “Plastics.” Well, Chris Mackin has a one-word prescription for public officials looking to reduce economic inequality and increase prosperity: “Assets.” Mackin, who for eight years ran a program for the state of Massachusetts focused on employee ownership, calls assets “a seemingly magical set of resources that work for anyone who owns them.” A powerful way to get assets into the hands of workers is through employee ownership. A look at the data confirms the power of employee ownership, the dominant form of which is through employee stock ownership plans (ESOP). During the Great Recession, the average job loss for U.S. companies was 12 percent. For ESOP companies, it was only 2.5 percent. ESOP companies grow about 2.5 percent a year faster than the average company, and employees get two and a half times as much in retirement assets as other employees. In 2013, while 7.3 million private-sector workers belonged to unions, more than 12 million were employee-owners. ESOPs are qualified retirement plans that are invested primarily in the common stock of the sponsoring company. The mechanics of creating an ESOP can be intimidating for employees and owners. 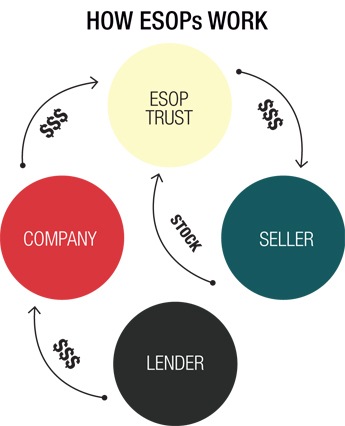 The capital needed for an ESOP is generally supplied through debt, and the owner has to pay for an independent appraisal of the value of the business. Then the legal trustees of the employees have to sign off on these valuations. This is where important roles for public policy come into play. State and local governments could start by surveying businesses to find out their succession plans, seeking healthy companies with owners who will soon retire and explaining the process to them. They could offer to pay a portion of the cost of an appraisal, which would be a small fraction of the billions that governments now pay in tax and other incentives aimed at job creation and business retention. Thousands of baby boomers are turning 65 every day, and many of them are business owners looking to sell out and retire. When the sale is to a competitor, a larger corporation or an out-of-state company, there is usually job loss. With conversion to employee ownership, the workers keep their jobs and the community keeps the company. Therefore, it’s surprising that only two states, Ohio and Vermont, currently have programs focused on supporting conversion to employee ownership. But interest seems to be picking up, according to the Center for Employee Ownership, which has model language for states to adopt. The center is working closely with Oregon’s business development department, and legislation supporting ESOPs is under consideration in Iowa and Connecticut. Employee ownership is hardly a new concept. It was a favorite of the late U.S. Sen. Russell Long of Louisiana, who explained his enthusiasm for it this way: “The problem with capitalism is that there are not enough capitalists.” Long was a public official who understood the power of assets. Why Shouldn’t Employees Own More Of The Companies They Work For? Dr. Steven Freeman of the University of Pennsylvania describes that granting ownership rights in corporations to employees has a profound effect on the employees´ commitment to the firms. A higher amount of employee commitment enables companies to perform better in critical areas. In many cases, the original owners’ shares can be worth more, even though they gave up part of the ownership, because employee-owners worked better than they did before receiving shares. Employees who own shares of a company feel that they have more influence in the organization, especially when they are encouraged to participate more fully. This leads to higher organizational commitment. Professors Joseph Lampel, Ajay Bhalla and Pushkar Jha from City University in London report that those organizations that grant company shares to their employees obtain improved company performance in product development, market expansion and sales. To increase employee commitment, businesses may choose from various strategies related to employee ownership plans. Among the options are: encouraging employees to purchase stock, giving it to them as a bonus or granting them stock through a profit-sharing plan. However, the most popular strategy in the United States for building employee ownership is called the Employee Stock Ownership Plan (ESOP). Through this type of employee benefit plan, a business sets up a trust and puts in it shares of its stock (or cash to buy shares). All company contributions to the trust are tax-deductible, and selling shareholders often receive capital gains tax forgiveness. The shares are then allocated, over time, to individual employees, and within a short period an employee gradually obtains full vesting of the shares in his or her account. When employees leave the company, the firm buys back their shares at fair market value, providing extra retirement assets. When employees are granted partial ownership of a company, many positive changes can occur. According to the National Center for Employee Ownership (NCEO), in the economic downturn that started in 2008, ESOP companies laid off employees at a rate less than 3 percent, while non-ESOP companies laid off employees at a rate higher than 12 percent. A study in Washington state found that employees at ESOP companies made 5 percent to 12 percent more in wages and earned nearly three times the amount of retirement assets of non-ESOP employees, calming possible apprehension about investing employees´ pensions in the same place where they are employed. A network of over 1,500 ESOP companies found that after implementing Employee Stock Ownership Plans, 84 percent of firms reported an increase in both employee motivation and productivity. A number of well-known companies in the West and Midwest are ESOPs. These include popular companies such as WinCo Foods and Schreiber. According to the NCEO, both of these companies advertise the fact that they are ESOP companies. Proud to have an Employee Stock Ownership Plan, these corporations use their identity as ESOPs for positive marketing purposes. Lampel, Bhalla and Jha found that, if a company has an ESOP, the public’s view of that firm is positively influenced. In the study, ESOP companies reported that their firms have greater positive images than others. That positive public view comes directly from the fact of a company being an ESOP. In his research, Freeman combines 29 different studies of ESOP companies. He reports that ownership plans often work best when they come along with increases in the regularity with which employees participate in decisions that influence their jobs. Freeman’s review of the studies shows that, co-existent with this increased involvement in company decisions, employees reported a rise in job satisfaction, motivation and organizational commitment. Not a bad set of outcomes. John Hoffmire is director of the Impact Bond Fund at Saïd Business School at Oxford University and directs the School of Business and Poverty at the Wisconsin School of Business at UW-Madison. He runs Progress Through Business, a nonprofit group promoting economic development. Tom Steele, Hoffmire’s colleague at Progress Through Business, did the research for this article. How the art of the inquiry can transform ideas into action. Journalist and advertising guru Berger (Glimmer: How Design Can Transform Your Life, and Maybe Even the World, 2009) examines the science of questioning and the ways in which the world’s top innovators have used it to their advantage. Establishing a “culture of inquiry” is a prudent move for both producer and consumer, writes the author, who cleverly examines the impact the “Whys, What Ifs, and Hows” have on the development of products like snow shovels, baby carrots and Crackerjack, among many others. Berger explores how, in asking “the question that defined the problem,” struggling entrepreneurs have moved from product conception to profitable execution. Begun as a website assisted by volunteers and researchers, Berger’s book expands further on questioning as a skilled art form that can be polished to gain its maximum benefits, even though the author finds its usage underutilized in today’s electronic multimedia age. Berger makes great use of both historical and contemporary examples of educators, innovators and business moguls who, by taking time to ask pointed questions of themselves and their respective industries, have both broadened their understandings of challenging situations and expanded the range of positive possibilities. Rhetorically (and hypothetically) asking the right questions also enabled entrepreneurs to establish wildly successful businesses like Netflix (“What if the video-rental business were run like a health club?”) or game-changing inventions like the microwave oven (“Could the energy from the radio waves be used to actually cook food?”). The author also touches on the reasons why we stop asking pertinent questions as we age and the ways parents can inspire inquisitiveness in children. If asking questions demonstrates an open willingness to know, Berger writes, the answers have the power to dispel ignorance. A practical testament to the significance of the questioning mind. Well-treated employees give more of themselves of the business. Published: Feb. 21, 2014 Updated: 2:33 p.m. Many consider culture to be soft, squishy and, hence, a secondary concern for business leaders. In reality, culture is probably the most powerful contributor to a company’s competitive advantage. Culture is the unique DNA of a company; no two companies have identical cultures, the same way that no two people have the same fingerprints. Your competitors can copy your products or your trade dress or your promotional strategy, but they can never replicate your culture. The most sustaining competitive advantage a company has is a deep, rich, powerful, values-driven culture. The late Peter Drucker, regarded as the father of modern management theory (with whom I had the pleasure of studying), observed, “Culture eats strategy for lunch.” As leaders, we often spend too much time focused solely on strategy and not nearly enough paying attention to culture. Culture is simply “the way things are really done” in an organization. It is the whole array of behaviors, from how emails are written to how job promotions are really given. It is the way we treat each other and others within our company’s ecosystem. Congruence in a culture is critical. When the people in a company reflect the values, intentions and commitments in their actions, there is congruence. People know what to expect, and they get what they expect, which builds trust. Without trust, relationships – personal or business – can’t be secure. And if relationships are not secure, it’s reflected in the marketplace. Not surprisingly, in the Conscious Capitalism community we talk a lot about Conscious Culture, and we celebrate companies that cultivate Conscious Culture. We recognize the essential role culture plays in supporting successful businesses. (As a result, “Building Fully Human Organizations” is the focus of our upcoming Conscious Capitalism event, CC 2014, in San Diego, April 9-11.) A Conscious Culture embodies the understanding that we are not simply economic agents or units of production, but fully human beings with multiple dimensions, all of which we bring with us to the workplace. Contrary to the belief that people are “human resources” to be leveraged for productivity, or “used,” in Conscious Cultures we recognize that people are sources of creativity, initiative and success. When we acknowledge the full spectrum of their humanity, and treat them with respect, care and love, when we invest in their ongoing learning, growth and development, people come alive and give their very best. This is true whether they are employees, vendors, customers or investors. When a business has a clearly articulated greater purpose that informs decisions and actions, and when it orients to creating value for all of its stakeholders, people are inspired and deeply engaged in creating value for themselves and others. Engaged employees are simply more creative and productive. They show up for work and stay with a company for a longer time, reducing turnover costs and building valuable knowledge, experience and social capital. They bring more of their discretionary effort to the job, giving a company more than it “paid for.” They treat customers, vendors and others with respect and care for the well-being of the company. A study, reported by Zeynep Ton, an MIT professor, in her recent book “The Good Jobs Strategy,” reveals that every $1 of salary increase for employees generated $4 to $28 in increased revenue for a major national company. Rather than looking to cut costs by squeezing employees, smart companies look to increase revenue by paying their people fairly and treating them with care and respect. This all sounds good, but some may wonder if a Conscious Culture is soft and squishy. Does love and care take precedent over productivity and performance? On the contrary! Conscious Businesses tend to be led and populated by highly motivated, passionate people, who recognize that results are the key to bringing their purpose to life and sustaining their commitment to creating value. Conscious Businesses are meritocracies and deeply results-oriented. In addition to their inspiring sense of purpose and Conscious Culture, they also set high expectations and standards for each other. And if performance lags, people and partner companies are given clear indications that they have to elevate their games, and if they don’t, they are removed or replaced. But this is always a result of a shared standard of high achievement, not from cost cutting or “Top Grading” arbitrary procedures. Leaders play a key role in establishing a Conscious Culture. As Ann Rhoades, former chief people officer at Southwest Airlines and JetBlue Airways, observes, “Leaders drive culture, culture drives behavior, behavior drives performance, and performance drives results.” How leaders treat others, how they live the values and commitments of a company, and how they hold the company’s purpose and focus on creating value for its stakeholders, sets the tone for everyone else in the organization. From there, everyone in an organization plays a role in bringing the culture to life, every day, through their words and actions. If business is going to fulfill its potential to elevate humanity and avoid social scorn, business leaders have to build more fully human organizations. Conscious Capitalism can provide a framework and foundation for doing so. Doug Rauch is CEO, Conscious Capitalism Inc.; founder, The Daily Table; former president, Trader Joe’s. I have just returned from an interesting experience in Washington. D.C.: a panel discussion with His Holiness the Dalai Lama. The event was sponsored by the American Enterprise Institute (AEI), a leading neo-conservative think tank responsible for much of the intellectual core and agenda of the Bush-Cheney administration. So why would I go to a place that co-engineered much of the thinking that led us into the disaster of the Iraq War and the financial crisis of 2008, costing us trillions of dollars, and causing massive waves of human suffering across cultures? Three reasons. One, I was invited by my friends at the Mind and Life Institute, which hosted one of the panels at the event. Two, because I am annoyed by the collective paralysis that we are witnessing in Washington and that is creating such huge problems both domestically and globally. I am more than happy to contribute anything I can to creating spaces for dialogue across intellectual and political divides. And three, because Arthur Brooks, who took the leadership at the AEI in 2009, is breaking away from many taboos of the old thinking and trying to do something new. It’s that kind of spirit that we need in many more places today. That being said, I don’t agree with many of the official AEI talking points. But I did discover, particularly in informal conversations, a lot more common ground than I imagined I would–including a thought-provoking conversation with Paul Wolfowitz (former U.S. defense secretary and former president of the World Bank). Here are three observations from my trip to Washington last week: discovering common ground, capitalism 4.0, and searching for neuroplasticity of the collective brain. Common ground: There is surprisingly significant common ground between the value-based part of the conservative movement on the one hand and people (like me) who believe that we are living in a moment of profound disruption that requires us to evolve and profoundly transform all our institutions of business, government, and education. What is that common ground? Three points: entrepreneurship; individual creativity; and mindfulness. Together these forces represent the power of business and social entrepreneurship and the power of civil society. But what’s missing? One thing is the environment. What could possibly be more conservative than environmental conservation? There is nothing inherently left or right in addressing environmental issues. As we see in the rise of the green parties in other parts of the world, they often are quite independent of the left-right axis of traditional political thought. But in the United States the far right has done everything to deny the environmental challenges that we’re dealing with today. You could sense the ripple effect of this denial in parts of the audience when the Dalai Lama and Diana Chapman Walsh, former president of Wellesley College, talked about environmental challenges like climate change. There was a bit of an awkward silence. It reminded me of the reaction I experienced in Davos at the World Economic Forum after suggesting that we break up all the banks that are too big to fail. An awkward moment like this happens when people hear truths that are obvious but unpleasant. Yes, they are uncomfortable, but those are exactly the moments when cracks to the future can open up. So my first takeaway is this: Traditional right-left polarization keeps the political discourse locked into false dichotomies of the past. Finding common concerns with many people at the AEI event reconfirmed my intuition that we need a completely different force field in politics today–not necessarily a new political party, but something very different from what we have now. During the first panel of the event, Jonathan Haidt of NYU suggested that today’s capitalism has three different story lines: (1) capitalism as heartless exploitation, (2) capitalism as the greatest discovery of mankind, and (3) a “more ethical capitalism” that relinks morals and markets, including a constructive role for religion and ethics. Haidt suggested that His Holiness believes in story 1 (“I am a Marxist,” the Dalai Lama occasionally likes to point out with a smile). Haidt said that his co-panelist Glenn Hubbard, Dean of the Columbia Business School, believes in story 2. Hubbard was previously the chief economic adviser to George W. Bush, oversaw the tax cuts, and became well known for his interview in Charles Ferguson’s Oscar-winning documentary film Inside Job (2010), in which the 2008 economic crisis is linked to the deregulation that Hubbard and many others (including Democrats) advocated for. Jonathan Haidt then said that he sees the emergence of story 3. That story begins with capitalism as one of the “greatest human achievements” (see story 2), but unlike story 2 also focuses on the externalities that we are facing now. Reflecting on Haidt’s point of view, which seemed to resonate with many in the room, I would like to point out two issues that time constraints prevented me from raising during the panel discussion on Thursday. First, the framing of the three stories misses a story that matters even more: a story of profound institutional transformation–story number 4. And second: the framing of the three stories lacks a structural analysis that gets at the deeper core of our institutional transformation challenges today. Just bringing in religion, morality, and some other good wishes will not do the trick. So here is another view that frames our current situation in the context of four logics and paradigms of economic thought. They all respond to the basic coordination problem of our modern economies, but in a different way. 4.0: Organizing around shared awareness and cultivating our commons → giving rise to co-creative relationships among the three sectors (government, business, civil society) in order to innovate at the scale of the whole system. These four logics mirror four different stages of economic development. Each earlier stage is included in the later ones. As economies move from 1.0 to 2.0, 3.0, and now possibly to 4.0, the consciousness of the human economic actors also evolves from traditional (1.0), to ego-system awareness (2.0), to stakeholder awareness (3.0), and to an eco-system awareness (4.0) that we see beginning today. The problem of our current economic debate is that we are trying to solve 21st -century problems with 19th- and 20th- century economic thought. That is: our discourse is stuck between “more markets and free enterprise” (2.0) and “more regulation and government” (3.0). In reality, neither of these approaches will suffice. Trying to solve 21st-century problems with 19th- and 20th-century economic thought is like driving a car at high speed while only looking into the rear mirror. That is what the economic debate looked like while it drove us into the crisis of 2008. As Einstein famously reminded us, we cannot solve our problems with the same thinking that created them. The present economic discourse does have three major views: 1.0–the authoritarian solution (à la Putin); 2.0–the free-market capitalism solution (the neo-liberal view); and 3.0, the stakeholder capitalism solution, which basically advocates “more of the same” in terms of the 20th century welfare state (the progressive view). But the problem with these three views–and the problem with Haidt’s three stories–is this: they all look backward, they all drive into the future while using frameworks of the past. What we need is a 4.0 framework and narrative that is based on transforming the patterns of economic action and thought from ego-system to eco-system awareness, in order to innovate at the scale of the whole (as I have laid out here). A panel moderated by Arthur Zajonc, president of the Mind and Life Institute, started off with remarks by Richard Davidson, one of the leading neuroscientists of our time. Listening to Richard Davidson’s intriguing presentation, I thought: Boy, the plasticity of the human brain is an unbelievable leverage point that points us to our ultimate leverage points as human beings: paying attention to our attention. It calls for a new type of leadership work that focuses on the cultivation of our inner instruments of knowing. But what would it mean to cultivate the neuroplasticity of the collective brain at the level of a whole system? That would seem to require a new type of leadership work that we all need to learn to engage in. I followed that train of thought by structuring my own remarks around four major points. One, that there are two sources of learning: learning from reflecting on the past, and learning from sensing and actualizing emerging future possibilities. • Observe, observe, observe: Go the places of most places of most potential and listen with your mind and heart wide open. • Retreat and reflect: Allow the inner knowing to emerge. Share, reflect, and go to an inner place of stillness to connect with your deeper sources of knowing. Contemplate Who is my Self? What is my Work? • Act in an instant: Explore the future by doing. Co-create rapid-cycle prototypes that generate feedback from stakeholders, which then helps to further evolve your idea. • And open will–the capacity to awaken and activate the deeper creative, entrepreneurial core that is dormant in each and every human being. There are many examples of exceptional business leaders who embody these deeper capacities in different ways. Steve Jobs is famous for his claim that the only way to do your best work is by following your heart. Do what you love, and love what you do. What he meant is that what matters most is not just What leaders do or How they do it–the process they use–but the Inner Place from which a leader operates, the quality of awareness and attention that they bring to a situation. An example of acting from this deeper place is Eileen Fisher, the founder and CEO ofEileen Fisher Inc., a highly successful women’s clothing company. She not only uses mindfulness practices for herself, as Steve Jobs did; she also introduced mindfulness moments in her company, just as Twitter co-founder Evan Williams has done in his company. For example, at Eileen Fisher, every meeting begins with a moment of stillness. My fourth point related to the pressing societal challenges that we face across societies today. The number one leadership challenge in today’s major systems and sectors of society is the same. Leaders need to change how their key stakeholder systems interact. Instead of interacting based on a narrow ego-system awareness, they need to collaborate based on a shared eco-system awareness–that is, an awareness that focuses on the well-being of all. 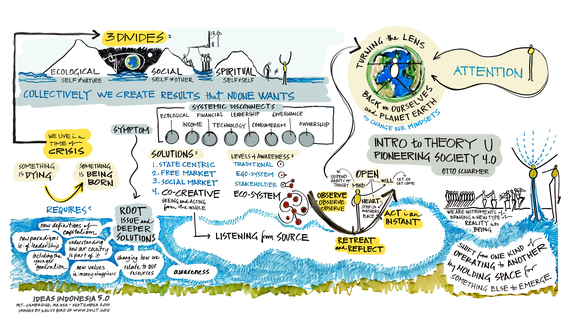 What does it take to move stakeholder systems from ego-system to eco-system awareness? It takes a journey. A journey that we are seeing in many successful stakeholder projects in many cultures that moves them through the stages of “observe observe,” to listening with their minds and hearts wide open, to accessing their “deeper sources of knowing,” and finally to learning by rapid-cycle “prototyping,” by connecting head, heart, and hand. I ended by asking the Dalai Lama how we can apply the power of mindfulness and compassion not only to individuals but to evolving the system as whole. He gave two responses. The first one: “I think you know better [than I do] (laughter). You already have the experience…” He then continued: “My thinking is to emphasize the education. That’s the fundamental approach.” That approach is part of a major initiative to renew the foundation of education worldwide that the Mind and Life Institute is about to launch. So here are my three reflection questions of this week: (1) Considering the collective paralysis in Washington DC, what would it take to shift the public discourse to a true dialogue? (2) Considering the evolution of capitalism: What would it take to take the eye off the rear mirror and onto the real challenges that we face in terms of Economy 4.0? (3) Considering the power of neuroplasticity, what would it take to unlock the neuroplasticity for our collective brain–that is, the sum total of our social, economic, and spiritual relationships? The framework of Capitalism 4.0. I will expand on these topics in my weekly blog posts here (bookmark this blog).